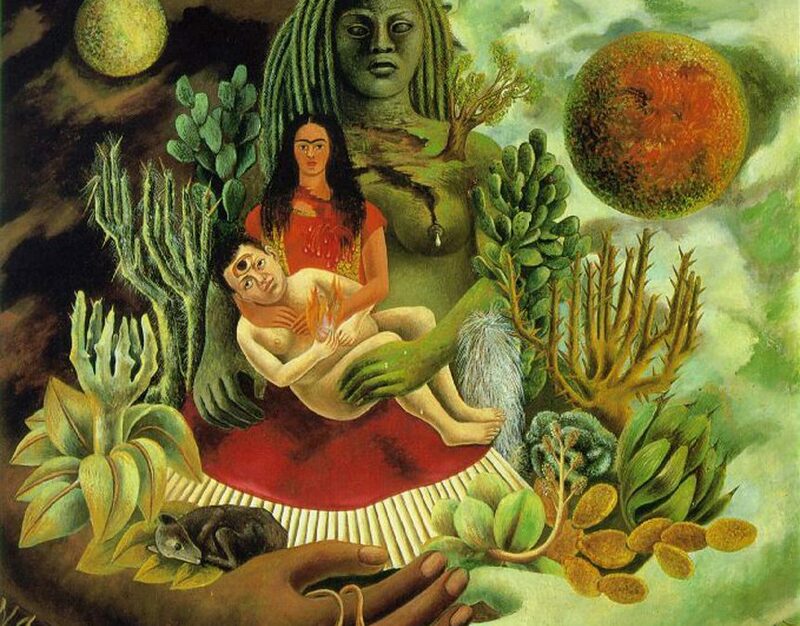 In this post, we will look at the life and works of Frida Kahlo as we celebrate her birthday on July 6! Frida Kahlo is a renowned artist whose works showed the pride she felt in her Mexican heritage and traditions. She is most known for her self portraits, the result of recuperating from an accident over the span of years. Frida Kahlo was immensely proud of her Mexican heritage. No matter where she was in the world, she would clothe herself in the traditional garb of a Tehuana maiden. She was also very involved in the political movements in Mexico and went so far as to lie about the year of her birth to feel more connected with the renaissance of Mexico at the turn of the century. Kahlo’s style of art embodies Mexican culture with her use of bright colors and indigenous style and symbolism. Frida Kahlo is an artist who for decades has been an icon of feminist creativity and Mexican folk art. Her home in Mexico, “Casa Azul”, was turned into a museum in 1958. The children’s Discovery Museum in San Jose has been offering a great interactive, learning experiences for children since 1990. The 52,000 square feet museum is a place for children of all ages, diversities, and backgrounds to discover technology, innovation and learning in unique and exciting ways. Whether it’s creating bubbles or discovering how the big city lights systems work in a safe and fun way, the museum is a must visit for a day of fun! There open from Tues-Sat 10-5PM and Sunday from 12-5PM, and admission for children and adults is $13.00. For more information visit their website at cdm.org. Looking for a place to have a fun and unique party? Art Attack Burlingame offers fun South Bay art classes and also has Arty Parties which are perfect for any occasion: birthdays, showers, girl’s night out and even office team building!